Revision exercise disguised as a fun activity. 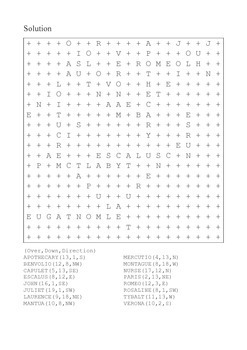 This puzzle asks students to find 16 words in the grid. 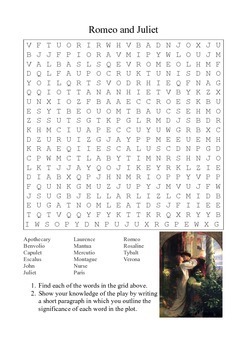 These are the names of characters or important locations in Romeo and Juliet. A second exercise gets students to briefly explain the importance of each character or location in the plot. This is the type of activity you could use to get students writing their own character sketches. It could be used as a filler on an occasion when you have nothing else prepared.